Doctors discover 4 bees living in a woman’s Eye, feeding on her tears. Doctors are calling it a “Medical first”. 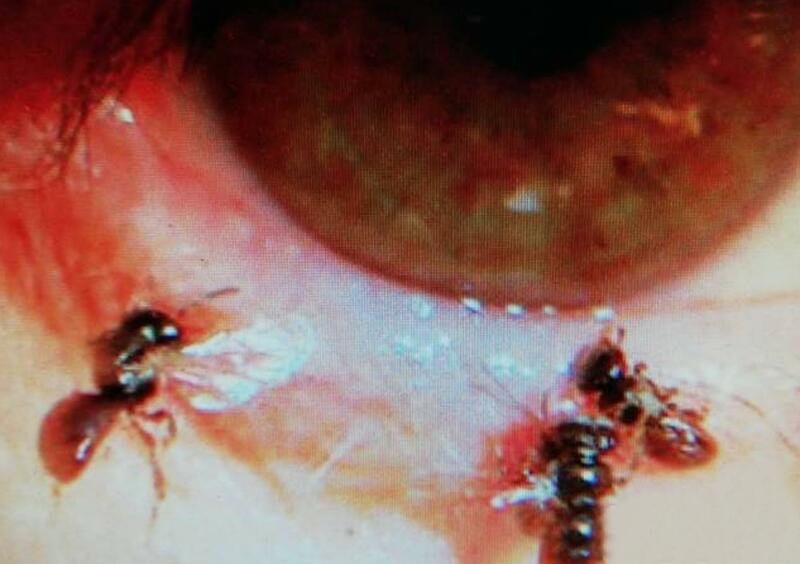 They’ve discovered 4 bees living in a woman’s Eye, living off of her tears. The patient, staying anonymous, and referred to as “Ms.He” had swollen eyelids and was suffering from cellulitis and keratitis – a skin infection and an inflammation of the cornea – as a result of the small insects feeding on her eyes. The woman was reportedly tidying up a relative’s grave at the cemetery by pulling out weeds, and a gust of wind blew what she thought was sand and dirt into her eye. The woman was taken to Fooyin University Hospital in Taiwan’s southern county of Pingtung. When ophthalmologists took a look in her eye, they discovered that “Sweat bees” had been living there. The bees were feeding on her tears as if they were “Salt licks”. Sweat bees apparently nest near graves and in fallen trees, and live off of human “Salt”. They were sucking on the salt in her tears. Man Catches his wife Cheating on him on Google Maps Street View while trying to find Directions.